The beautiful glass works by more than a dozen area artisans continue to amaze all this month. The botanically-themed pieces are all designed by St. Petersburg Hot Glass Workshop and the Duncan McClellan Gallery. Visually stunning and intriguingly varied pieces are on view in both the Museum of Botany and the Arts as well as in the Conservatory. All works were made in St. Petersburg, Florida, and are available for purchase with a significant percentage of the proceeds benefiting Selby Gardens. 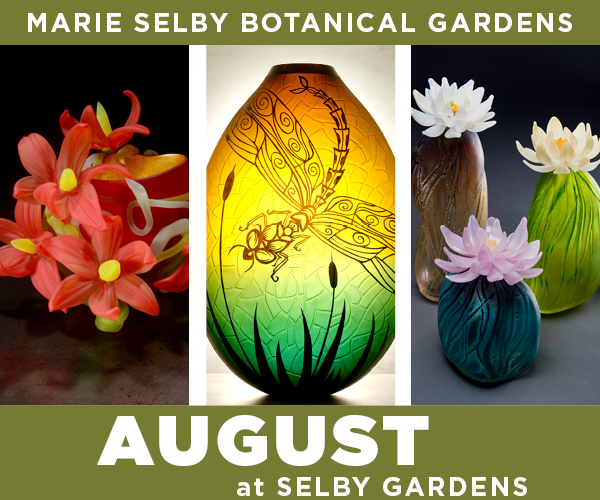 Glass blowers from the St. Petersburg Hot Glass Workshop and the Duncan McClellan Gallery are partnering with Selby Gardens to bring this botanically-themed art glass exhibition to the area. All works were made in St. Petersburg, Florida, and illustrate a variety of glassmaking techniques.